Hello Friends ! welcome to our new trick that name is How To Recover Deleted Messages On Whatsapp. Whatsapp believe that your chats are very important, and it work hard to make sure that you never lose them. Local backups will run automatically every day at 2am and save your database in a file on the phone itself. You can back up your WhatsApp data using Google Drive and/or a local backup. If you looking for something this type then you are in the right place. There is one of the best whtsapp trick will help you to recover deleted messages from whatsapp. Everyday you have a lot of work to do. You chat with your friends and family and more people in a day. Due to some other reasons or may be unconsciousness you deleted your whatsapp messages. But don’t worry here is a trick that you can get back all of your messages on whatsapp. In our daily life we chat many important thing. And really that messages are really important to us. But sometimes we deleted those messages and sometime later we want it back. Suppose that messages from your loving person and suddenly you deleted the messages. Now what can you do to get back them ? Here we are sharing a trick that can really help you to get back them. Follow the instructions to know how to do it. Whatsapp saves all conversation on SD Cards of your phone. 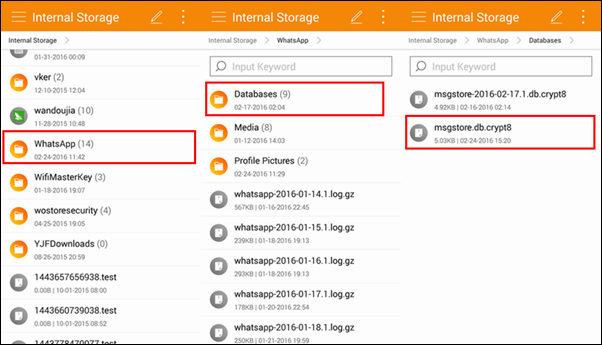 Now you need to go to SD Card then Whatsapp and then Database. Here you will find msgstore.db.crypt file which contains all messages which you have received and sent in the same day. Not only this but also you can do more that you can also find another file in same folder msgstore-yyyy..dd..db.crypt which contains all messages sent and received in last seven days. You can simply open these files on any text editor from you phone. Now finally you can now able to read all your WhatsApp messages which were deleted. Hope you like this trick. You can share this trick to your friends or you can share it on you timeline that all of your friends know about the trick.